Garden State rock and rollers often lament that Bruce Springsteen’s classic song “Born to Run” narrowly missed being named New Jersey’s state song. But the tide is turning, and a new offering just might make up for that bitter injustice. 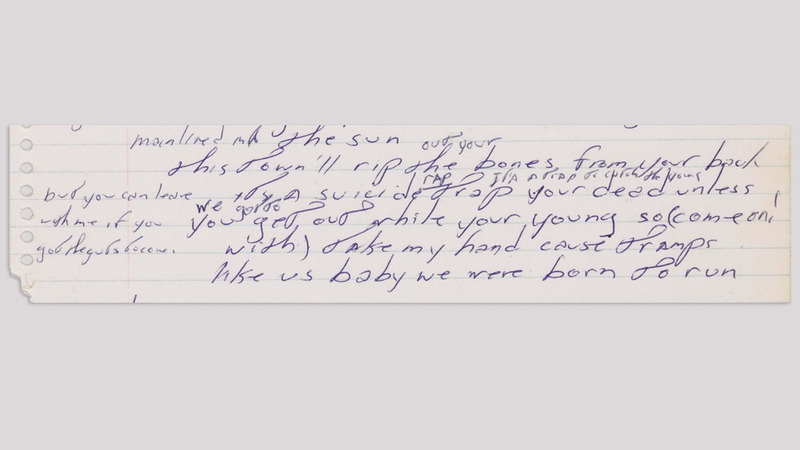 Next week, fans of Bruce Springsteen will have a chance to bid on a bit of rock and roll history when The Boss’s lyrics to his 1975 breakout single“Born to Run” hits the block in an online auction at Sotheby’s. “The Springsteen smash became an essential American anthem, catapulting the New Jersey native from a local phenomenon to a national rock star,” says Richard Austin, senior vice president and head of the department of books and manuscripts at Sotheby’s. The then 26-year-old Springsteen, he says, spent six months writing and finalizing “Born to Run” in his home in Long Branch, New Jersey, following the release of his first two albums, Greetings from Asbury Park, N.J. and The Wild, the Innocent & the E Street Shuffle—both of which received critical acclaim but only had modest commercial success. Released by Columbia Records on August 13, 1975, “Born to Run” peaked at No. 3 on the Billboard 200. The song, which clocks in at four-and-a-half minutes, says Austin, remains classic, having been ranked as the Grammy Award–winning singer’s greatest song by Rolling Stone magazine in 2013. Born to Run was also the title of the singer-songwriter’s 2016 autobiography.